It’s likely that you would like to shop for books and other content on your NOOK Tablet. The bottom line, of course, is that without books, magazines, videos, music, apps, or document files, your NOOK Tablet is simply a fancy way to play Sudoku. 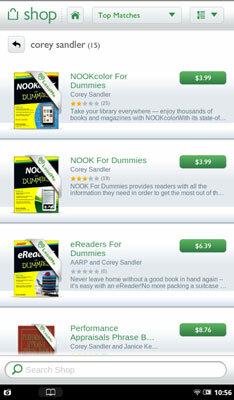 You can browse the changing NOOK store by category or list. Books. Choose from romance, mystery, crime, science fiction, biography, memoir, business and personal finance, history, humor; think of it as strolling the aisles of a store. Also included in the book department: comics. Magazines. Choose Cosmopolitan to Maxim, from National Geographic to Southern Living, from Bon Appetit to Fitness Magazine. In most cases, you can buy one issue or subscribe. Newspapers. Choose from The New York Times, Financial Times, and The Onion. You’ll find not just national papers but also regional publications. Kids. Several hundred books (picture and chapter) are there for pre-readers through teens. Included are Read and Play Books, which add narration, sound effects, and interactive features. Apps. A growing selection of small programs (apps) is what you find here. B&N says it wants to concentrate on book-related apps as well as carefully selected games and utilities for people on the go. Music+Video Apps. 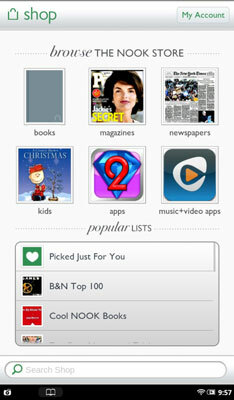 This special section of apps is supposed to enhance audio and video on the NOOK Tablet. In addition, you can go through Popular Lists to find things like the B&N Top 100, The New York Times bestsellers, and new releases. Again, these lists change over time and include things like seasonal specials (Christmas, Mother’s Day, Father’s Day, and the like). Tap any of the lists to explore. To read more about a suggestion, double-tap the cover. When you know exactly what it is that you want to purchase, the NOOK Tablet has a search feature to allow you to find that item. You can search by author name, subject, or title. Tap the Search Shop field at the bottom of the Shop screen. The virtual onscreen keyboard appears. Type the title, author, or subject you’re looking for. You don’t have to distinguish between a title, author, or subject. The search engine will sort through all of the possibilities. Scroll through the results by dragging your finger up or down. A green button shows the prices on the B&N site. If you see a gray Purchased label, you already bought that title for the current account; once you’ve paid, you can always download it again.